The Empire Shall Fall is an American metalcore band that was only founded in 2008, yet they are not just another newcomer, as one of their founding members is Kevin Leach who used to be the frontman of Killswitch Engage. Their four song demo got a lot of attention on Myspace, so that it was only a question of time before they were signed by a label. Their debut album is simply called Awaken and contains re-recorded versions of the songs from the demo and four new tracks. The Killswitch Engage link is undeniable, as the music is solid metalcore with lots of groove and a great sense of dynamics. More unusual is the high amount of breaks which sets the band apart from the competition. The second track Lords Of War for instance sounds less brutal and reminds me somewhat of Maylene and the Sons of Disaster. More extreme is We The People that comes with many experimental parts, even some jazz, which sounds wonderfully weird. Voices Forming Weapons is a more trendy piece with its catchy chorus and would be an ideal candidate for a single release, expect that it’s running for over six minutes. The rhythmic Our Own has an impressive bass parts, spoken vocals and a slower pace, another proof of the band’s variety. This band is still new on the map, but they instantly left an impressive visiting card with their debut. Those who don’t want their metalcore to sound too straight and prefer bands like Between The Buried And Me, Deftones and At The Drive-In (all of which have left some influence), will have a great time with Awaken. 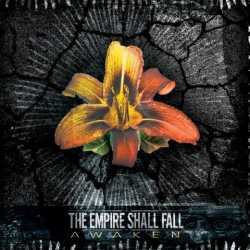 The Empire Shall Fall have demonstrated that metalcore doesn’t have to be synonymous with monotony!